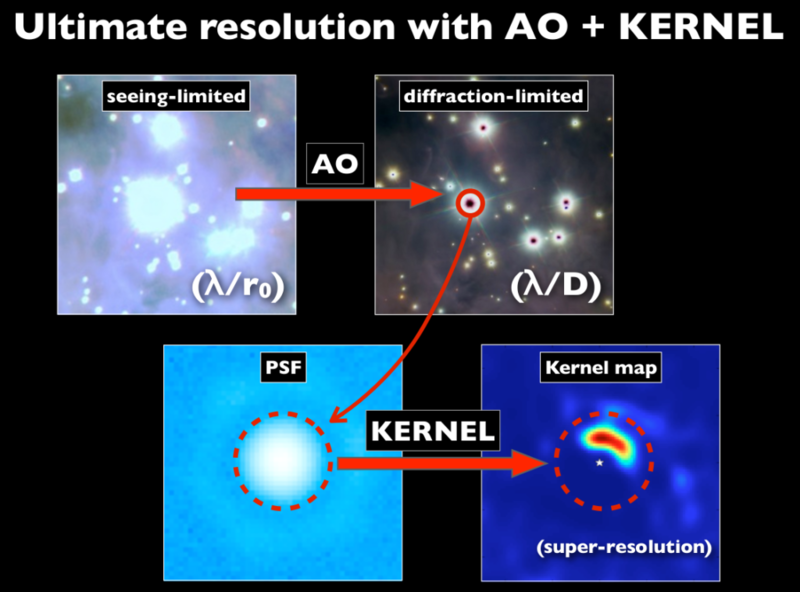 Combined with adaptive optics (AO), a kernel-phase data analysis makes it possible to further improve our understanding of astronomical images, and bypass the generally accepted limit of angular resolution, imposed by the theory of diffraction. This is sometimes refered to as “super-resolution”. Project KERNEL is funded by the European Research Council (ERC) under the European Union’s Horizon 2020 research and innovation programme (grant agreement #683029). Astronomy requires large telescopes to improve the sensitivity and the angular resolution of its observations. Of these qualities, angular resolution is the most difficult to maintain in the optical and near-infrared, since the atmosphere reduces it to that of a 10 cm aperture, regardless of the telescope size. On the one-hand, Adaptive Optics (AO) actively compensates for this effect but the improvement is often partial only. On the other hand, interferometric techniques (most notably sparse aperture masking interferometry) passively allow the extraction of self-calibrating observables, that boost the angular resolution, but severely affect the sensitivity of observations. The KERNEL project will enable every optical telescope equiped with AO to reach its ultimate angular resolution potential at full sensitivity, using a Fourier-phase framework, with applications ranging from the reinterpretation of archival science data to the development of wavefront control strategies for the giant segmented aperture of large telescopes like the space-borne JWST, or the upcoming generation of ground based extremely large telescope (ELTs). The consequences of this project will have a major impact on the design and scientific exploitation of future high angular resolution instrumentation on the existing generation of 8-10 meter class telescopes as well as on the upcoming generation of 30-40 meter giants, championned by Europe and its E-ELT. My Innovation Is… on Youtube? Kernel-phase science paper accepted by A&A! Habilitation à Diriger des Recherches… soutenue!